The best collaboration of course comes when a team is gathered together in the same room, leading to faster decision making and more productive interactions. But, no matter how hard we try, face-to-face meetings simply are not always possible. That’s why we have technology to help us fill in the gap. Business VoIP and Unified Communications come with the power of conferencing, both voice and video. Combine that with the right set of conference room hardware, like conference phones and cameras, your business can utilize meeting spaces for remote collaboration. But of course, the quality of your collaboration will come down to the quality of your remote interactions. Its not only the internet or phone service that is being utilized that can have an impact on quality. Hardware plays a major role as well. That’s why its imperative to outfit your conference rooms with proven hardware from quality, known names. That’s why we put together this massive, complete least of conference room hardware to help businesses find the right technology for their specific needs. Whether your team is looking to turn a meeting space into a video conferencing hub, or simply upgrade existing speaker phones or microphones, there are solutions that fit into different sized rooms, as well as different budgets. Ranging from familiar names like Logitech to big industry players like Polycom, we searched for the highest rated items that we felt offered the most value. 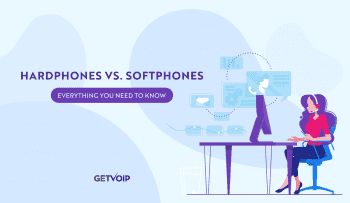 Conference phones are easily a staple of all conference rooms — it just wouldn’t be a conference room without the right phone. And to be honest, most of the time these devices are overlooked. But, in reality, the quality of your conference phone can and will directly impact the quality and experience of your phone call. The last thing you want in your productive meetings it poor call quality leading to inaccuracy. But finding the right conference phone doesn’t have to be difficult, and you don’t need the most expensive option on the market. Sure there are great phones with some fancy bells and whistles like touch screens, mobile phone integration, and even applications directly on the phone — but if your team isn’t going to use it, why spend the extra cash? We searched around and found a good mix of both advanced smart conference phones, and some more basic options. One of Polycom’s most advanced offerings, the RealPresence Trio 8800 is a great option to outfit your medium or large sized conference rooms. Two ethernet switches, wi-fi and Bluetooth connectivity make it easy to setup the 8800 and seamlessly link to multiple devices. The 5 inch touch screen makes for simple call controls and some pretty advanced functionality. In fact, the 8800 phone is even capable of working directly with a Polycom video conferencing solution. 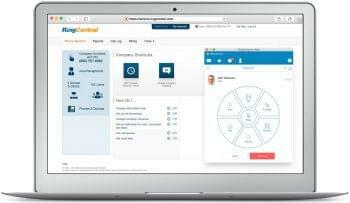 But as just a phone, the 8800 is equipped with a 20-foot pickup range, Polycom Noiseblock to help reduce background interference, and even Skype for Business or Microsoft Exchange integration. This phone is also packed with not one but three cardioid microphones as well as a loudspeaker capable of 92 dB — way more than enough to hear across the room. This conference phone is around $910 and can be found on Amazon here. VTech offers some of the most cost effective solutions when it comes to conference phones and similar hardware. Coming in at under $300, the VCS704 also sports a bit of a unique party piece — four wireless DECT microphones along with 2 central fixed microphones in the base unit. With multiple wireless microphones, the VCS704 works great for medium to large conference room, enabling users to extend voice coverage by placing the microphones around the room, or in front of specific speakers to ensure they’re heard well. The microphones also have up to 70 hours of battery life, with 8 hours of talk time, so you don’t have to worry about losing connection mid call all the time. Now to prevent any annoying feedback from the wireless mics, VTech built in Echo Cancellation to cut out any overlap, as well as Dynamic Background Noise Reduction to keep things quiet. This conference phone is around $250 and can be found on Amazon here. 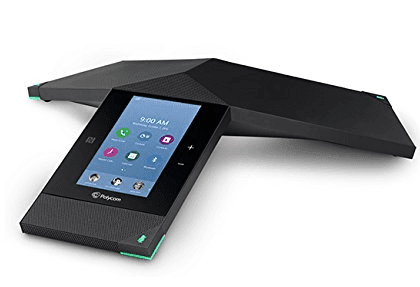 If your team is searching for a conference phone equipped with a touch screen, yet the Polycom 8800 is a little too much of an investment, then the Yealink CP960 might do the job. While still on the costly side, this conference station also includes a 5 inch color touch screen, as well as wireless pairing with Bluetooth, and even USB ports. In fact, what’s truly unique about the CP960 is that the phone runs the Android mobile operating system. The CP960 also supports the addition of two wireless microphones to extend range even further to cover a large area, and has a built in speakerphone. The 5inch, high resolution 720×1280 touch screen makes it simple to navigate and access call controls, and the 20 foot microphone range and the ability to expand the system with speakerphones and other devices makes the CP960 a very capable offering. This conference phone is around $610 and can be found on Amazon here. 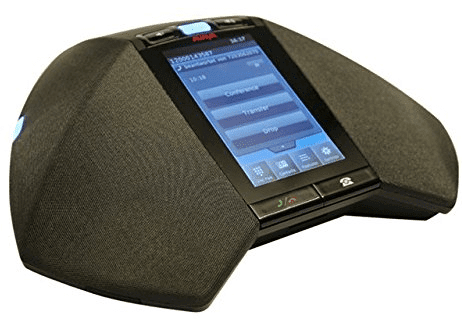 Now if you’re looking to stay with the known Polycom name, but don’t quite need the extra features and touch screen of the 8800, then look no further than the tried and true SoundStation IP 5000. Without a touch screen, the SoundStation 5000 still provides the great call quality and experience one would expect from a Polycom solution. While the microphone’s range might not be the most impressive on our list, this conference phone was designed with smaller spaces in mind, and focuses on providing great sound quality for up to six participants. Standard feature are of course included, and even some more advanced functions like Power over Ethernet, Polycom HD Voice technology, advanced call handling, security and provisioning features, as well as a high-resolution display. 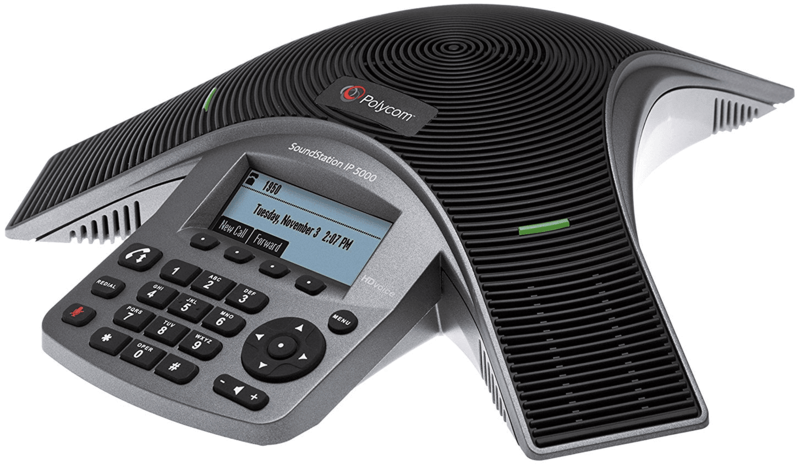 If your team is looking for a basic conference phone with a proven track record, then its hard to go wrong with a Polycom device. This conference phone is around $280 and can be found on Amazon here. A simple yet sophisticated solution, Avaya’s B149 provides great voice quality and compatibility with the industry leading VoIP provider’s solutions. As a plug and play solution, the B149 can get your conference room up and running in just a few minutes. Capable of fitting in smaller to large conference rooms, Avaya’s standard conference phone includes 360° surround sound, powerful speakers, and of course noise suppression to help keep background noise to a minimum. As a bit of a unique feature, the B149 also offers call recording right on the device itself. The phone supports an SD memory card to save your recordings on, making it easy to transfer to a computer when necessary. The system has a standard range of 320 square feet, and can also be expanded to an increased range of up to 750 square feet with expansion microphones, like other options on the market. This conference phone is around $260 and can be found on Amazon here. Right off the bat, the GAC2500’s party piece has to be the Android operating system the device runs on. With the full Android mobile OS, users gain access to the Google Play app store. 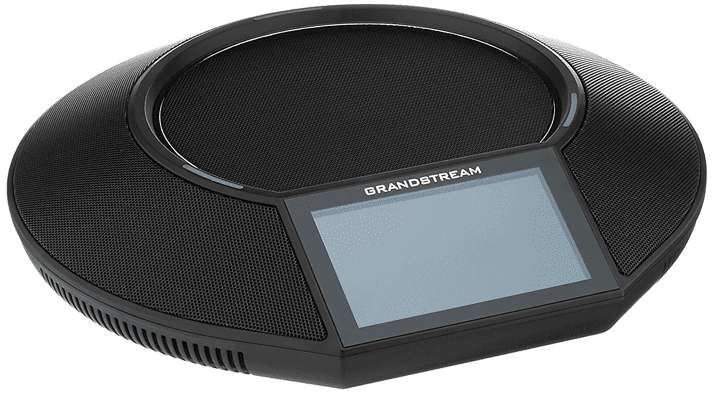 This means you can download different applications onto your Grandstream conference phone, or even go ahead and create your own applications to run on the phone. So, even if this phone is missing an important feature, chances are an app exists or your team can simply create one. For example, instead of using a different solution for call recording, just download an Android app right onto the conference phone. Looking beyond the Android OS, this conference phone is capable of supporting up to 6 SIP accounts, 7-way conferencing, has a 4.3 inch touch screen, and of course supports Wi-Fi and Bluetooth as well as Power over Ethernet. The system also allows for users to daisy-chain multiple phones together to expand the system. This conference phone is around $314 and can be found on Amazon here. One of Cisco’s more recent offerings is their 8831 setup. 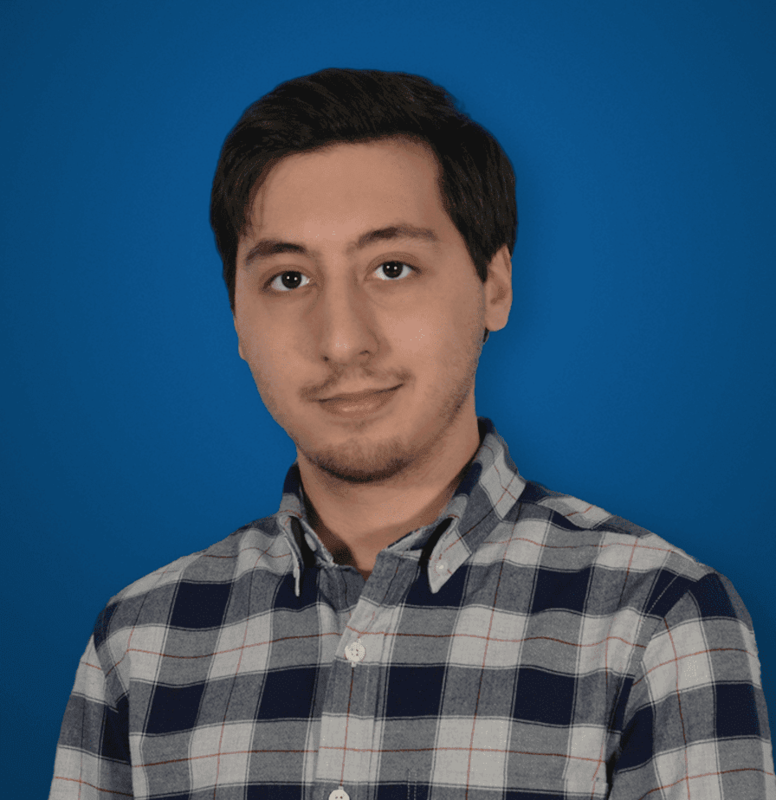 While an untraditional configuration, Cisco’s unique set up actually offers some extra expandability not found on standard conference phones. With an independent control unit, independent speaker and independent microphones, users can customize the setup to fit their exact conference room needs. For a large conference room, expand with more microphones and a speaker phone to reach across the room. The 8831 is also a wireless setup, allowing for even more flexibility. The display can even be moved around the room separately from the rest of the unit. Cisco claims the device provides an “audiophile sound experience” with its “full-duplex two-way wideband audio hands free speaker.” At the end of the day, this is a simple yet scalable solution that can fit the needs of almost any size conference room, from small to large. This conference phone is around $485 and can be found on Amazon here. 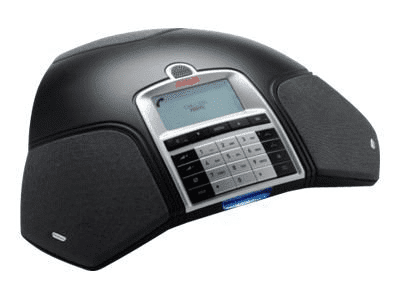 Alongside Polycom and Yealink, Avaya also offers an advanced conference phone with a 5 inch capacitive touch screen to make, setup and control calls. However, unlike the other devices, Avaya’s offering is built around their Aura software platform, as opposed to an Android operating system. This enables existing Avaya customers to take full advantage of the platform and other existing Avaya phones. However, that doesn’t mean the B189 is only compatible with Avaya service — instead, it supports both H.323 and SIP trunking solutions. 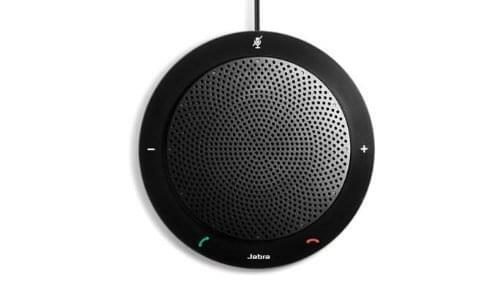 With a large conference speaker, four microphones and “Avaya OmniSound technology,” the B189 ensures that everyone is heard, and can be heard no matter where they are in the conference room. At home in medium to larger sized conference rooms, the B189 can pick up voices from a 20-foot radius, and the impressive 96 dBs speaker can be heard from much further. This conference phone is around $516 and can be found on Amazon here. When it comes to microphones — whether you are video conferencing or web conferencing — you want to ensure that your voice as crystal clear as possible, while also avoiding background interference. Depending on the size and layout of your conference room, there are a number of different options to choose from. Just like with a speaker phone, the quality of your microphone will directly impact the quality of your conference, and no one wants muffled, jumbled, garbled or scratchy audio destroying productivity. The key is not only a quality microphone, but also the right setup for the situation. If your conference room is large and open, then hanging ceiling microphones placed throughout the room can over wide coverage without taking up any desk space. If your conference room is long or wide and you want to ensure every speaker, even Jim on the other side of the room, is heard at equal volume then gooseneck or individual desktop microphones will get the job done. For small teams just huddled around a table, then a desktop speakerphone is all you need. 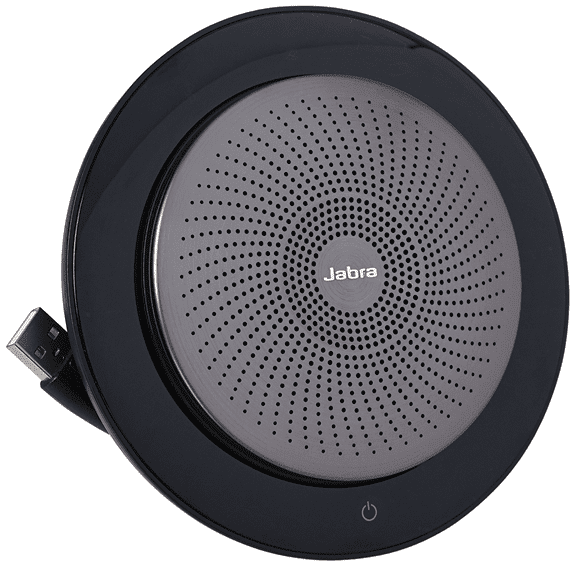 As one of the most basic setups, this Jabra Speak 410 Speakerphone offers both a microphone and speaker in a convenient little package. 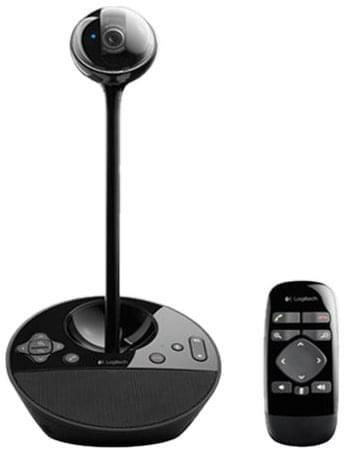 With a USB connection, this speakerphone can be plugged into any laptop or computer to handle VoIP calls from any service. 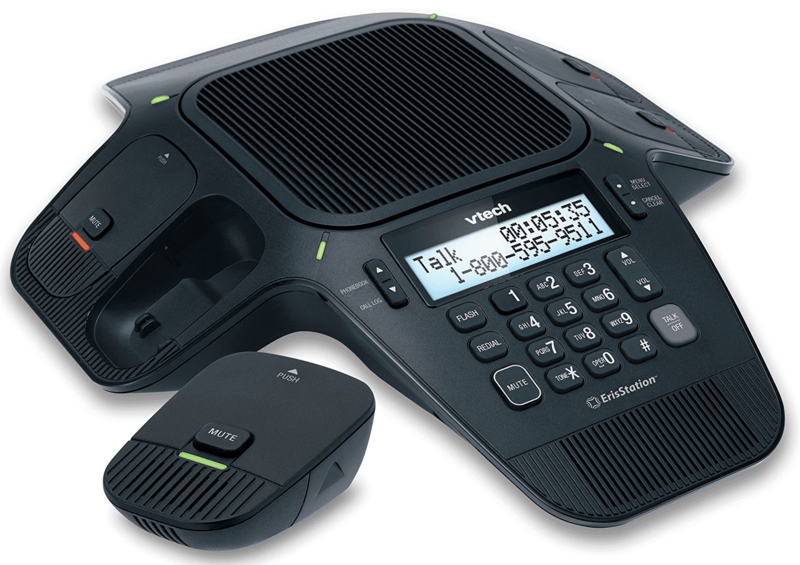 While advertised for Skype specifically, the Speak 410 is compatible with all UC systems and VoIP clients. Specifically designed for one-to-one or small group conference calls, the Speak 410 is right at home in smaller conference rooms, personal offices or even huddle rooms. 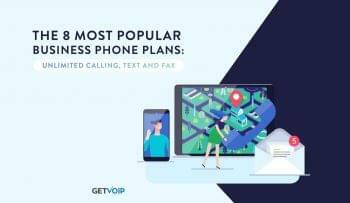 The device itself contains physical volume and call control buttons, enabling users to start, end, and mute calls directly from the speaker, instead of forcing users to switch focus to their VoIP client on their computer. The Speak 410 also has an auxiliary port, allowing users to plug in a call center headset for private calls. LED light indicators of call status also help provide visual guidance. This microphone is around $75 and can be found on Amazon here. 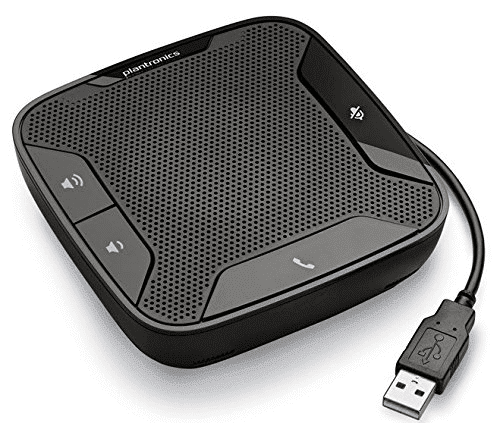 Another basic speakerphone offering, the Plantronics 610 M, was designed with mobility in mind. This portable USB speaker is focuses on simplicity and ease of use, allowing users to hold an instant conference anywhere they are. 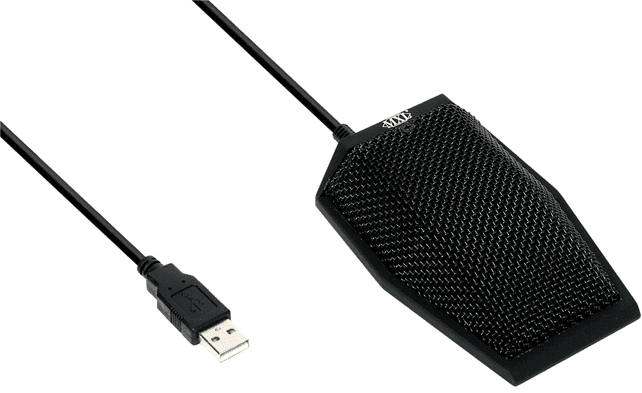 The USB connection allows the 610 M to plug into almost any mobile device or computer, and the 3 feet cable provides plenty of reach without being cumbersome. Integrated call and volume controls, along with a mute button, make it super easy to stay in control and never miss a beat. Ideal for smaller conference rooms or private offices, the 610 M would make a great addition to any travel or mobile office setup, transforming any private area into a little conference room. The 610 of course works with any VoIP or UC client, and is even compatible with Kensington style locks to help keep the device secure and ensure it doesn’t go missing when traveling. 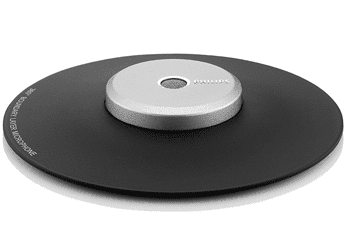 This flying-saucer looking desktop conference microphone from Philips is a great simple option that provides basic, straight-forward functionality. This disk shaped mic is capable of picking up sound from 360°, and also utilizes the vibrations from the table, and even air pressure, to provide crystal clear sound. Of course with total omnichannel coverage, this guy can sit right in the middle of your conference table and still pick up everyone speaking in the room. You’re sacrificing some extra features like call controls directly on the mic itself, but for the sake of simplicity. Just plug this mic into your standard 3.5mm audio input on any laptop and it’ll work with any UC or conferencing app. This microphone is around $135 and can be found on Amazon here. If you are in the search of something a bit more powerful and high-end, but don’t want to quite break the bank, take a look at the Jabra Speak 710. This Amazon’s Choice solution is optimized for Unified Communications, with a USB connection for universal compatibility and simplicity. In terms of functionality, the Speak 710 can provide in-room coverage for up to 6 speakers, and of course can pick up sound from 360°. The Speak 710 is also capable of complete mobility, with up to 15 hours of battery life and only 4 hours to charge, making it a great choice for those on-the-go. For those with a Jabra Link 370, the Speak 710 comes with a direct adapter, as well. This microphone is around $190 and can be found on Amazon here. This boundary condenser microphone from Beyerdynamics is a bit of an nontraditional setup. Instead of simply resting on your desk, taking up space, this microphone is designed to be embedded directly into a ceiling, wall or even a table top. The main benefit of course is an incredibly capable and powerful microphone that doesn’t require any desk space or annoying wires. The half-spherical polar pattern is ideal for picking up voices in a wide area, and the unobtrusive design makes these microphones both convenient and visually appealing. These discrete mics can transform any meeting space into a fully equipped conference area when paired with a set of speakers, and even a camera for video conferencing. The high sensitivity of the microphone helps guarantee a constant output volume, even when speakers are a long distance from the mic. These condenser mics are a best fit for large conference rooms that require a large area of coverage. This microphone is around $166 and can be found on Amazon here. Sometimes the best option for a large conference room is not one mic with a wide coverage, but rather individual microphones for each speaker. 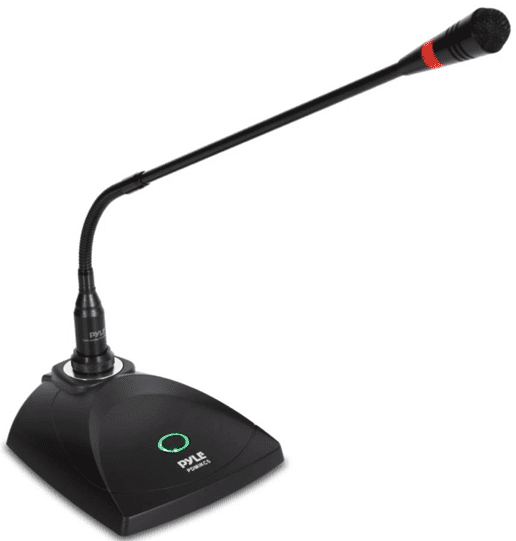 Gooseneck microphones, like this Shure CVG18, are great for those conference rooms with really long tables and multiple speakers, with a microphone placed at each seat on the table. This helps ensure that every speaker is heard clearly, and at the same volume, no matter where they are seated. 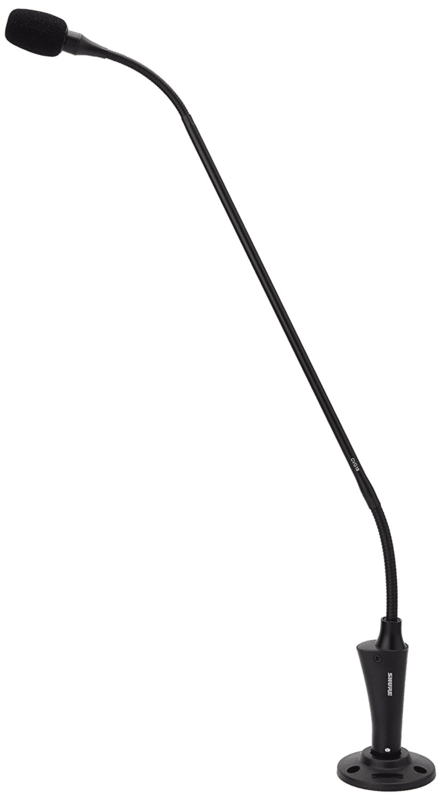 Gooseneck microphones are both cost effective, and unobtrusive in their design. This 18-inch example from Shure has a cardioid polar pattern microphone designed specifically for speech, as well as “CommShield Technology” to help guard against any unwanted interference from cell phones and other wireless devices. The microphone itself has “dual gooseneck sections” for full articulation, allowing users to position the mic the best way possible. This microphone is around $99 and can be found on Amazon here. 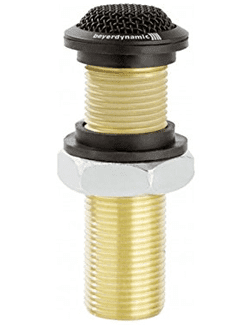 This Pyle Desktop gooseneck Mic is a much more cost effective option, including a base for the microphone along with an LED indicator and an on/off toggle switch. This mic still retains some flexibility, but does not have the two points of articulation like the more expensive Shure mic does. However, this Pyle mic does include a built-in acoustic pop filter, ultra-wide frequency response, and a high signal output for voice clarity. This mic is also battery operated, providing for even more flexibility, enabling users to move the mic around the room with them. Quite frankly, a condenser microphone for under $40 is a bit of a steal. Add in the fact that this microphone comes included with a base, and is essentially wireless, and the package is really compelling. Of course gooseneck microphones make the most sense in a large conference room, but they can of course work in smaller environments as well. This microphone is around $27 and can be found on Amazon here. Another non-traditional microphone setup, this ClearOne ceiling mic has made it onto our previous conference room lists as well. 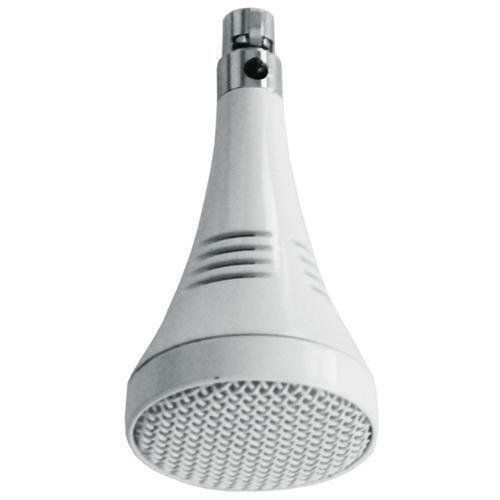 Best suited for large conference rooms that require a wide area of coverage, these ceiling microphones provide total room coverage from all directions, while hanging out of view. And, if one microphone isn’t enough, simply hang multiple mics around the room to ensure total coverage. These mics are exceptionally great for large video conferencing rooms, as they not only provide the coverage necessary, but also providing a clean and professional image. Gooseneck mics are great for ensuring voice coverage, but they can block the view of speakers and participants in a video call — these ceiling mics can instead hang outside of the camera’s range. This ceiling mic actually includes three individual microphones, and specifically includes a built-in low cut filter to reject unwanted noise. To further help prevent unwanted distractions, adaptive ambient gating controls constantly adjust to changing environmental noise. This microphone is around $437 and can be found on Amazon here. If searching for the best of the best in conference technology, look no further than Polycom’s offerings. Their HDX Ceiling Microphone actually offers a bit of a step up from the ClearOne in terms of both sound and build quality. The HDX of course still provides all the great benefits of a ceiling microphone, like a clutter-free work space and wide 360° audio coverage. 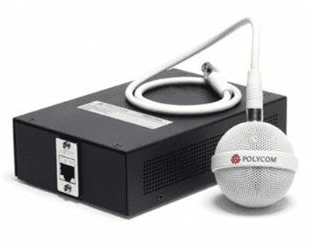 Polycom is of course also known for their amazing sound quality, and the HDX is no different with three cardioid microphones, and “Polycom Siren 22 audio technology.” The 12 foot pickup range covers a total of 450 square feet, and one single microphone could provide total coverage for a small to medium conference room. Outfit a large conference room with multiple ceiling mics for total coverage without the clutter of multiple gooseneck or desktop microphones. This kit provides both the microphone, as well as the base unit. This microphone is around $825 and can be found on Amazon here. Sitting in the middle ground between a gooseneck and a speakerphone type mic is this MXL USB conference microphone. Simply just a microphone with a 6 foot USB cable, this setup offers a ton of flexibility. USB means the mic can be plugged into any computer or laptop, and the small size means less clutter and total portability. Similar to speakerphone style microphones, these desktop mics are great for small conference room or mobile office/travel setups. This MXL AC404 even has a built-in headphone jack for privacy and speaker monitoring. The microphone itself provides 180° coverage and a 25 foot radius, allowing for multiple speakers per mic. These little guys are great for huddle rooms as well, especially when paired with a camera setup for video conferencing. Multiple mics can even be stringed together to a USB hub to provide coverage throughout a large conference room, offering the same sound coverage as other expensive options. This microphone is around $68 and can be found on Amazon here. Of course, just like with conference phones and microphones, purchasing a high-quality camera for holding video conferences will go a long way. Not only is video conferencing one of the most effective methods of remote collaboration, due to the personal connection if directly seeing and interacting with others, but a high-quality camera with the right features will make all the difference. When searching for a camera, try to find the highest resolution and frame rate possible, this will ensure your video is always crystal clear and silky smooth. The bigger the resolution the better, and the higher the frame rate the better. The general standard of course would be 1080p 30fps, but there are options out there for 4k cameras, and even 60fps cameras. Whether your team is looking to outfit a huddle room with a small web cam, or a large conference room with an expensive video system, there are a number of options in all price ranges. Pair one of these cameras with a capable, free video conferencing solution to really keep costs as low as possible. We wanted to focus on the solutions that even smaller teams can utilize to achieve that exact same collaboration experience. 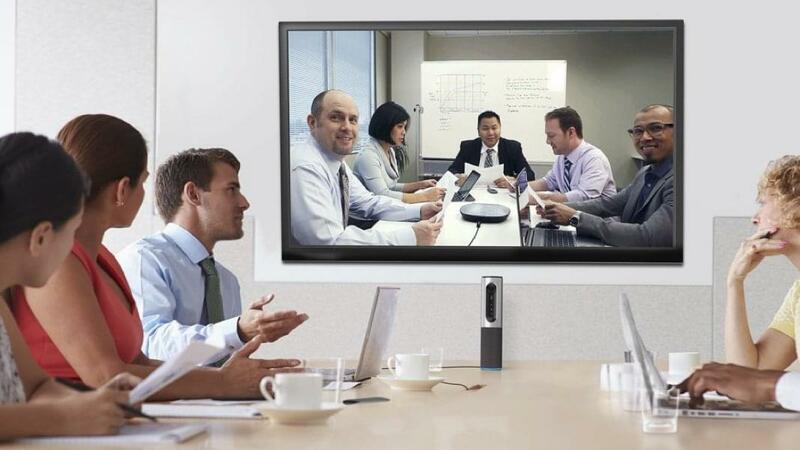 Designed with small conference and huddle rooms in mind, Logitech’s BCC950 is a bit of an odd little fellow. Despite looking like something out of a sci-fi movie, this camera offers a full 1080p camera at 30 fps, with a fairly wide 78°field of view. This unit contains a base, which contains the speaker and some basic controls, and a camera that extends on a stalk about 12 inches above the base. The unique benefit here is that the camera sits nice and high up, ensuring the entire room and all participants are in view. An autofocus feature goes a step further in ensuring that not only is everyone in the room seen, but they are seen in crystal clear quality. If the 78° field of view isn’t quite enough, the camera is capable of rotating to a full 180°, and can even pan, tilt and zoom in. The omnidirectional, built-in mic can hear speakers up to 8 feet away from any angle, and echo cancellation helps reduce unwanted noise. This camera is around $180 and can be found on Amazon here. If your conference room is a bit larger in size, and requires something a bit more advanced, Logitech’s PTZ Pro Camera rivals some of the bigger names like Aver and HuddleCam. This HD quality cam has a standard 1080p resolution, and captures video at 30fps to keep things smooth and professional looking. A wide 90° field of view also provides total coverage, along with an extended mechanical 260° pan and 130° tilt. With a USB connection, this camera can connect to just about any computer or even mobile device, making it more flexible than some other similar options on the market. The PTZ Pro Camera represents Logitech’s top of the range offering, with the BCC950 coming in at the bottom of the range. This camera is also certified to work with Skype for Business, Cisco Jabber and WebEx, but will also work with all other VoIP and UC clients. The PTZ provides a professional level experience without breaking the bank, and flexibility not normally found on higher tier solutions. This camera is around $790 and can be found on Amazon here. Another strong option for a professional conference camera is the HuddleCam HD-10x-GY. Quite a mouthful, this powerful little camera offers the same 1080p, 30fps video as the Logitech. With a 61° field of view, remote pan, remote zoom and remote tilt, the HuddleCam is also capable of covering a wide area, and would fit best in medium to large conference rooms. 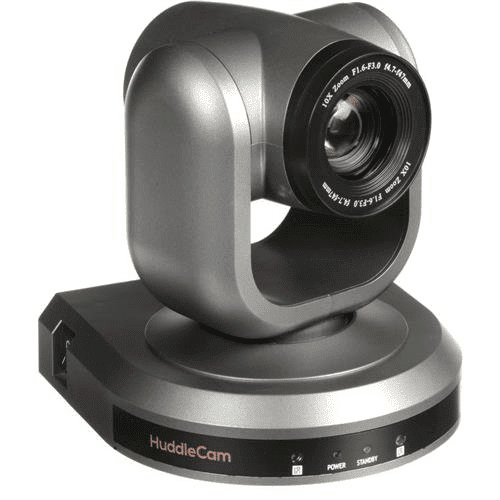 Just like the Logitech PTZ, the HuddleCam HD-10X also connects to any device with a USB cable, providing the same great flexibility and simplicity as a webcam. But, this camera is also backed by the HuddleCam name and quality. 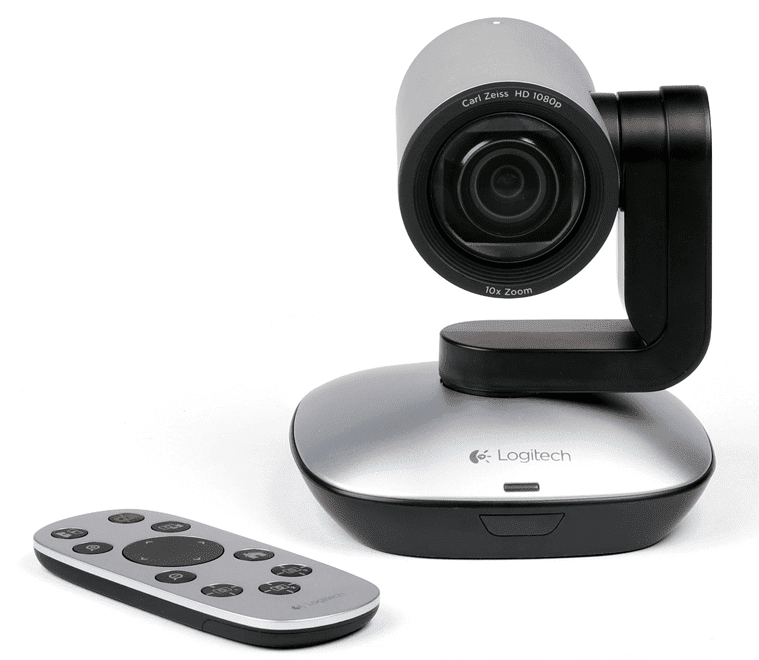 While Logitech has a solid reputation of consumer-grade electronics, HuddleCam is more known for their enterprise grade solutions. Build quality and service provided by HuddleCam might just not be matched by other competitors at lower price points. Overall, the HD-10X-GY is a solid choice when looking to outfit a large conference room with an enterprise grade, professional quality camera. This camera is around $899 and can be found on Amazon here. Thankfully, if neither the HuddleCam or Logitech PTZ do the job, there are plenty of options when it comes to high quality, professional grade conference cameras. 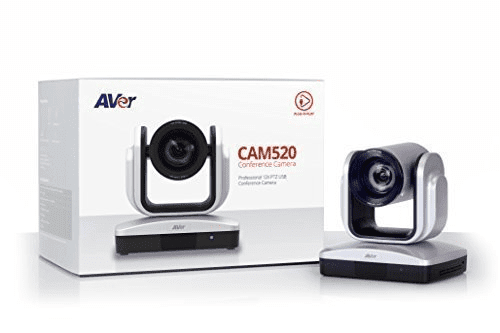 Aver Information’s CAM520 comes in at a similar price point as the other two cameras on our list, while offering just a little bit more. In fact, the CAM520 is capable of producing 1080p HD quality video at 60 fps, as opposed to the 30 fps of the other cameras. This helps ensure an incredibly smooth video, without any stutters or hiccups. The higher the frame rate, the smoother the video. If you are looking for the absolute best video quality in a conference camera, then it would make sense to look for an option with a higher frame rate, not just resolution. This camera also sports a 12x zoom, as opposed to 10x from the other options on our list, and provides an 82° field of view along with pan and tilt controls. This camera is around $799 and can be found on Amazon here. Not every single conference room requires a high-tech, professional grade dedicated camera. Instead, smaller spaces can absolutely get by on a much simpler, cost friendly setup. For example, huddle rooms do not require a large HD camera with remote pan and zoom controls. Instead, you’d be better off searching for a high quality webcam that can capture the entire space. Samsung’s SmartCam HD Pro is one strong option, although admittedly they are many to choose from. While this particular camera is capable of a 1080p resolution, the frame rate drops down to 15 fps. At 720p, this camera is capable of 30 fps recording — more than enough for a small conference room. But even if your room is a bit larger, the 128° ultra-wide angle will keep everyone in view. One truly unique feature on this camera is the inclusion of a Micro SDXC memory card slot, enabling users to record and store video directly on the camera itself, for later viewing on an external device. 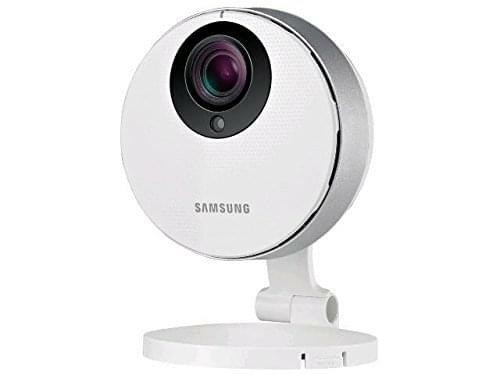 This camera is around $140 and can be found on Amazon here. 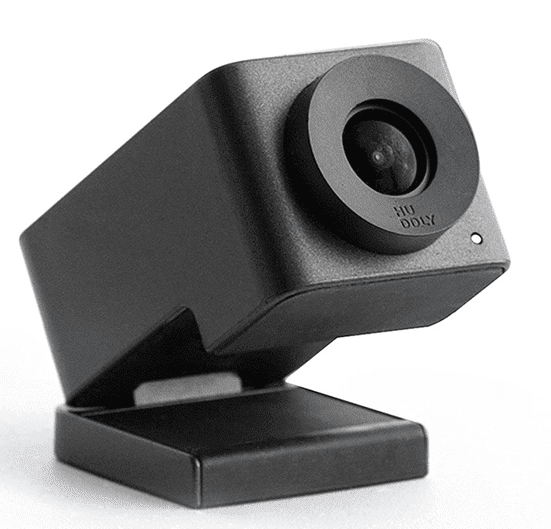 While not a traditional or expected name you would come across during camera shopping, the Huddly GO Video conferencing camera is one worth considering. This unique little camera connects to any Windows or Mac computer with a USB cable, and provides support for all standard VoIP and UC clients like Skype, Zoom and Google Hangouts just to name a few. Designed with small spaces in mind, the Huddly is best for meeting rooms with 2-6 people, or even conference rooms with 12 participants for live streaming. One of the Huddly Go’s party pieces is its ultra-wide angle lens, capable of capturing a total 150° field of view. Quality is a bit lower than other options, at 720p, 30fps, but is still more than clear enough for basic video conferencing needs. The Huddly Go is also backed by the provider’s platform, providing regular updates with new image quality and collaboration features to continue to enhance the experience as time goes on. This camera is around $499 and can be found on Amazon here. At the end of the day, the quality of your conference experience comes down to more factors than just the service. The hardware involved in every step of the process will also make an impact on your conference, good or bad. Investing in the right hardware can go a long way in providing the best experience possible, with quality sound and crystal clear video. Utilizing the right technology is also the best way to take full advantage of the service that your business is paying for. It doesn’t take much to invest in the right hardware, just some basic research to understand what it is you are buying, and some basic planning to understand the specific requirements that need to be filled.